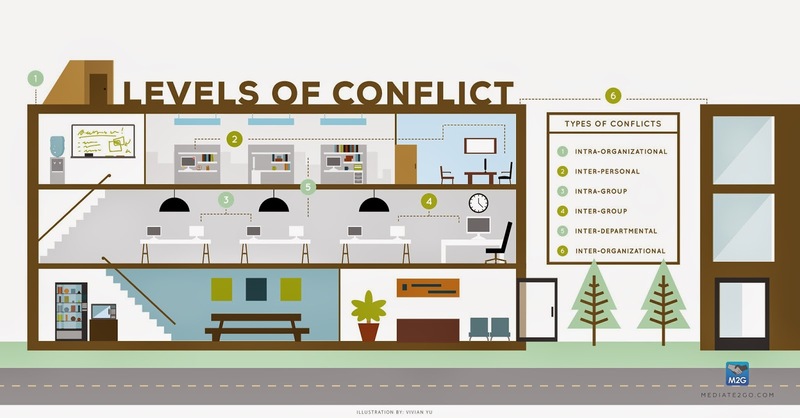 The following are types of conflict, which are the medium within which conflict occurs in organizations. Intra-organizational conflict is an umbrella term for any type of conflict that takes place within one organization. Interpersonal conflict is one of the lowest levels of conflict, taking place between two or more individuals within the organization who are oppose one another, knowingly or not. Sometimes one employee may be frustrated with their boss, but never bring forward their concern. Intra-group conflict is conflict exists between members of one particular group, say members of a hiring committee that don’t agree a new candidate. Inter-group conflict is conflict among members of two or more different groups, such as between management and employees. Inter-departmental conflict is similar, but at the level of departments. Inter-organizational conflict occurs between different organizations, such as between two competing firms in an industry. 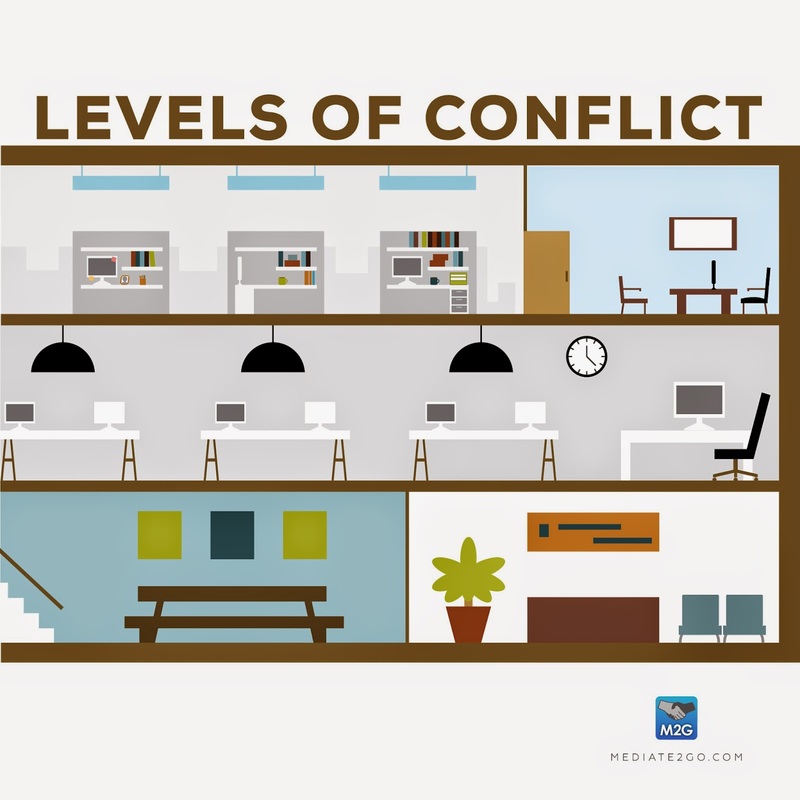 Within these various levels, conflicts can have various dynamics and directions. It’s useful to understand in which category a conflict belongs in order to take into account every individual involved and the power dynamics at play. Vertical conflict occurs between hierarchical levels, say between management and employees. Horizontal conflict, on the other hand, takes place between different individuals, groups or departments at the same hierarchical level, say between two competing departments that have similar power and authority in different areas. Specific types of conflict within these vertical and horizontal levels include the following common types. Line-staff conflict is conflict about who has power and official authority over specific tasks and processes. Role conflict is about expectations of tasks, primarily when they are not communicated effectively or the communication given is not received effectively. Work-flow interdependency conflict takes place when groups and individuals that are inter-dependent (rely on one another) must collaborate together but fail to do so effectively. Domain ambiguities or role-conflict take place when people or teams are put in unclear situations and they do not understand who must take responsibility. Resource scarcity conflicts, a common type of conflict in organizations, takes place where resources are scarce, such as during financial constraints or even if office space is limited, creating conflicts between individuals, teams and departments. Power or value asymmetries are conflicts at a fundamental level, where people that rely on one another are seemingly starkly different from each other in the areas of status, values or influence. 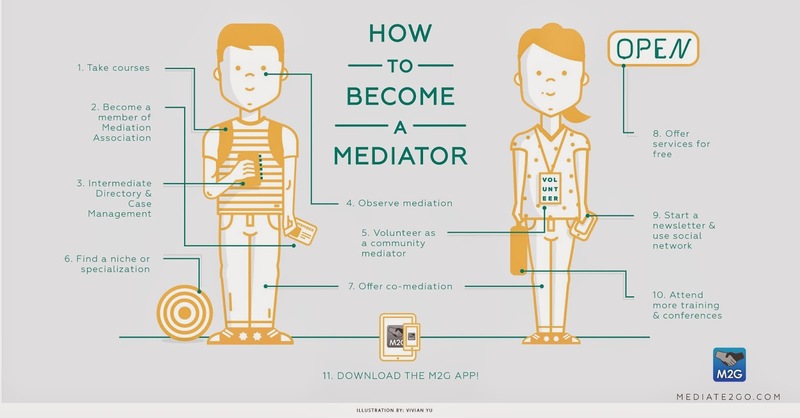 Visit Mediate2go.com to self-resolve your conflicts, or to find a mediator to help you resolve more complex issues.